Clemson, SC – Clemson will play nine teams that posted winning records last year and eight teams that went to bowl games on its 2002 football schedule. It is the toughest Clemson schedule in history based on number of bowl teams and teams with winning records from the previous season. Clemson will play 12 regular season games for the first time in its history. Seven of the games will be at Death Valley and five will be on the road. Three of Clemson’s four non-conference games will be at home. Clemson will open the season at Georgia on August 31st. It is the first of a two-game home-and-home series with the Bulldogs. The 2003 season is slated to kickoff with a Clemson vs. Georgia matchup at Clemson on August 30, 2003. It will be the first meeting between the two schools since 1995, a game won by Georgia, 19-17. The two schools played 11 games between 1977 and 1987. Nine of those 11 games were decided by a touchdown or less and the record between the two schools was 5-5-1. 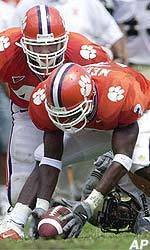 Clemson’s first home game of the season will be against Louisiana Tech, the team the Tigers defeated in the Humanitarian Bowl (49-24) at the close of the 2001 season. The two teams never played prior to 2001, but now will play twice in a three-game period. Clemson will open its ACC schedule on September 14th against Georgia Tech at Death Valley. The two teams have played six straight games decided by exactly three points. Clemson won this past year 47-44 in overtime. After a third straight home game with Ball State, the Tigers will travel to Florida State for a Thursday evening game that will be televised nationally by ESPN. It will be Clemson’s third Thursday evening game in history on the ESPN package. Clemson will have the Saturday before (September 28) and the Saturday after (October 5) open. Clemson will play consecutive home games against Wake Forest and NC State in mid-October. The Wake Forest game will be the annual Homecoming/Parents Day weekend. Clemson’s November 16 game against Maryland will be Military Appreciation Day. Clemson has not lost in Death Valley to Maryland since the 1985 season. Clemson concludes the regular season against South Carolina. It will be the 100th game between the two teams and special activities are in the works for that contest at Death Valley. The Clemson vs. South Carolina Rivalry dates to 1896, the first year of Clemson football. “This is a very challenging schedule,” said Head Coach Tommy Bowden. “I have heard so much about the Clemson vs. Georgia rivalry, now I will have a chance to experience it. There is great history between the two programs, some great players, great games. “Overall, it is the toughest schedule I have faced as a head coach. With eight bowl teams and nine games against teams that had a winning record last year, we will obviously be playing outstanding programs every week. Notes: Clemson at Florida State game is a Thursday evening game on ESPN. Group Tickets available for the Louisiana Tech, Ball State, NC State and Maryland games. Season ticket price is $191.